“We all have power and privilege,” said Haran Vijayanathan to more than 30 second-year MPH students on a late Thursday night for the School’s pilot anti-oppression training workshop. 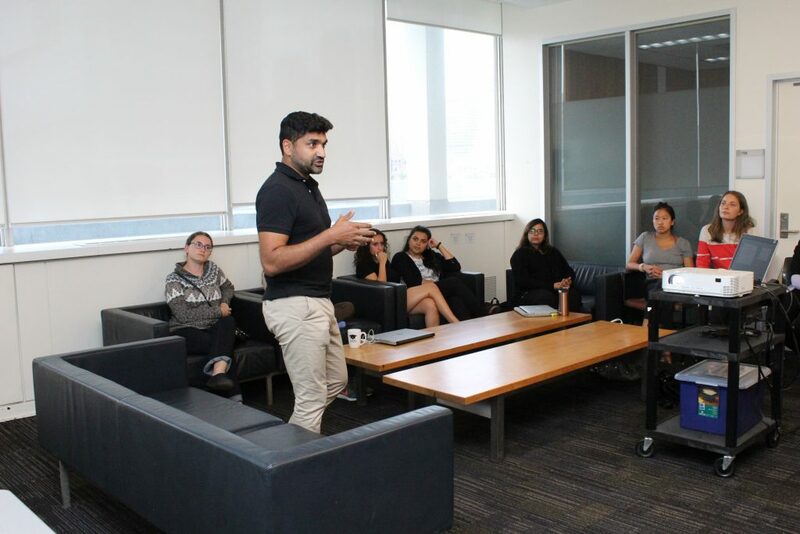 The workshop is a training pilot project that allows DLSPH students to learn more about the structural powers at play when interacting with racialized or vulnerable groups from a public health perspective as they begin the new academic year. “It depends on the context, how we use it and when we are told when we cannot use it. We can also use our power and privilege to support individuals,” said Vijayanathan, an adjunct instructor at Seneca College and prominent LGBTQ community leader. “Now, what does oppression mean?” he asked. The room went silent but remained attentive. Vijayanathan had facilitated a panel a week prior with 40 first year MPH students, fielding questions about racism, oppression, prejudice and stereotypes. “We have many students coming in with experiences of marginalization based on a strong history of oppression,” said Ananya Banerjee, an Assistant Professor of Social and Behavioural Health Sciences. “When having these conversations about privilege in a diverse group, it’s important that everyone feels like they’re part of it,” said Banerjee who led the pilot with full support from Charlotte Lombardo, Master’s Graduate Coordinator. Over the years, both Banerjee and Lombardo have met students who struggled with these topics and were concerned that they would not be equipped to address them when working with marginalized populations. The workshop is a safe space for all students to explore sensitive topics that they would not likely broach in an open forum. Topics like racism and sexual identity are hard to approach especially if students are not part of that particular community. At times, even intra-racial oppression like shadeism is a topic that racialized groups often experience within their communities. The choice of Vijayanathan was a no-brainer for Banerjee. He worked with the Toronto Police on the Bruce McArthur case and is often asked to facilitate similar workshops outside of academia. During the training, Vijayanathan explained how some public health policies and procedures could be deemed as not inclusive to marginalized communities and shed more light on what it means to be an ally. Even as a racialized instructor, systematic oppression is not an easy topic for Banerjee to discuss. “I still need the right tools. Even within racialized communities, there are still different types and forms of oppression. I want to make sure I am respecting and honouring my students from these communities,” said Banerjee. Students see the benefits of the training and many even acknowledge the biases within and outside their racialized communities. “I came into public health knowing that there are a lot of different communities I want to work with. Having an understanding of the different ways other people are oppressed because it manifests itself in different ways, is a critical skill,” said Gideon Quaison who is a second-year health promotion student. Following results of an informal survey, Banerjee has her eyes set on a School-wide initiative.